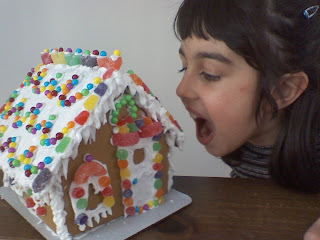 My wife recently bought a ginger bread house kit for her "kids" and I had a lot of fun putting it together with Hannah and Sabrina. We didn't realize that we had to let it sit for a few hours before we could start decorating. The icing which is used as glue needed time to harden in order to hold the walls and roof together. So we waited........! I was the icing contractor and the kids were the architects and designers. Hannah want to eat it but we told her to wait. I love working on projects with my kids. I enjoy playing, teaching, learning, and spending time with them. My kids are awesome!